KANEOHE — The quest for perfection rolls on for Moanalua. Kelci Sumida and Taylor Hayes each scored a goal to help No. 5 Moanalua to a 2-1 win over No. 7 Castle in an Oahu Interscholastic Association girls soccer game Saturday afternoon. Na Menehune improved to 7-0 on the season and assumed sole possession of first place in the OIA Division I East standings, while the Knights suffered their first loss and fell to 6-1. With the win, Moanalua avenged a postseason loss to Castle in the third-place game of last season's league tournament. 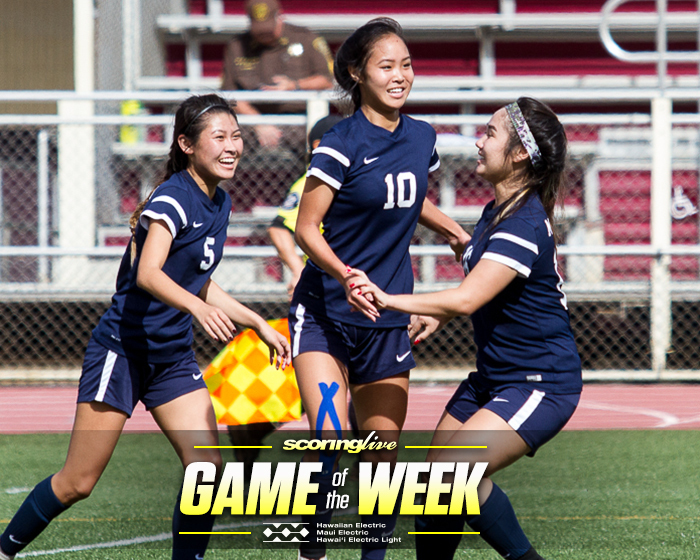 "That definitely motivated us because we really wanted to win this game and stay undefeated and we just wanted it after last year," Na Menehune junior forward Kelci Sumida said. With a win in any of its remaining three regular-season games, Moanalua can clinch a top-two finish in the D1 East and consequently lock up a first-round bye in the 12-team OIA tournament, which gets underway on Jan. 22. "It feels great," Sumida said. "We worked really hard in practice and we knew this was going to be a really big game for us because we knew that Castle was a really good team, so we just really wanted it and we really worked for it." Sumida's team-leading 11th goal of the season opened the scoring Saturday near the midpoint of the first half. After receiving a pass just beyond midfield, she dribbled her way through two defenders and fired a right-footed shot from about 15 yards out into the left side of the goal, just beyond the reach of Castle goalkeeper Alexis Chang-Takayama. "I just remember that the ball was coming and then I was on the outside, so I just touched it past the defender and I just tried to shoot it into the side," said Sumida, who is tied for second amongst the top goal scorers in the OIA this season. Moanalua coach Nikki Dela Pena said her team used the first portion of the game to feel things out, following the blueprint that was laid out in the days leading up to the contest. "That was kind of the game plan: to check out what was going on in the first ten minutes, making sure the formation was right, making sure our match-ups were right, and then as soon as we did that we were able to make our little adjustment and put the right people into the attack to play our game," Dela Pena said. The score held until the 53rd minute, when freshman Taylor Hayes netted her sixth goal of the year on a left-footed strike from about 15 yards out that found the upper left corner of the goal to give Moanalua a 2-0 lead. "Taylor Hayes stepped up today," Dela Pena said. "We've had confidence in her this whole season and I'm glad that she used this as kind of a break-out game for herself." Del Pena credited Hayes along with junior Kaylee Sumida — Kelci's twin sister — for holding down the midfield. "Our midfielders, this was the best game that they've played. They really stepped up. They made sure they covered the ground defensively and offensively, so we were able to secure both sides of the field," Dela Pena said. Just minutes after Hayes found the back of the net, Castle got its lone goal of the game from sophomore midfielder Saphyre Garbett off a corner kick from Danielle Chang. The Knights mixed and matched their pieces throughout the match, most notably sophomore Bethanee Hanaike — who started at forward in the first half, moved to the midfield at the start of the second only to finish the match up top — but struggled to connect passes. "We were just completely off our game. Everybody was off today. It was just one of those days," Castle coach Millie Dydasco said. "We didn't play how we normally play. With balls on the ground, we were just kicking it with no purpose. We were kicking long balls — we don't play like that — and we were kicking balls right to them. We were playing narrow instead of playing wide when we did have the ball, but credit Moanalua. They were the better team today and they deserve to win. This was probably our worst performance this season." Moanalua put 10 shots on goal, while Castle had seven. Goalkeeper Alexis Davis posted six saves for Na Menehune, while Chang-Takayama made eight stops in goal for the Knights. Standouts Amaia and Ciana Rivera did not start the match for Castle due to disciplinary reasons. Both came off the bench at the 16-minute mark. Ciana Rivera, the team's leading scorer, is the reigning OIA East Player of the Year and was a First Team All-Hawaii selection last season.